Less than two weeks ago, the foundation was completed for a new mixed-use tower in the Financial District. 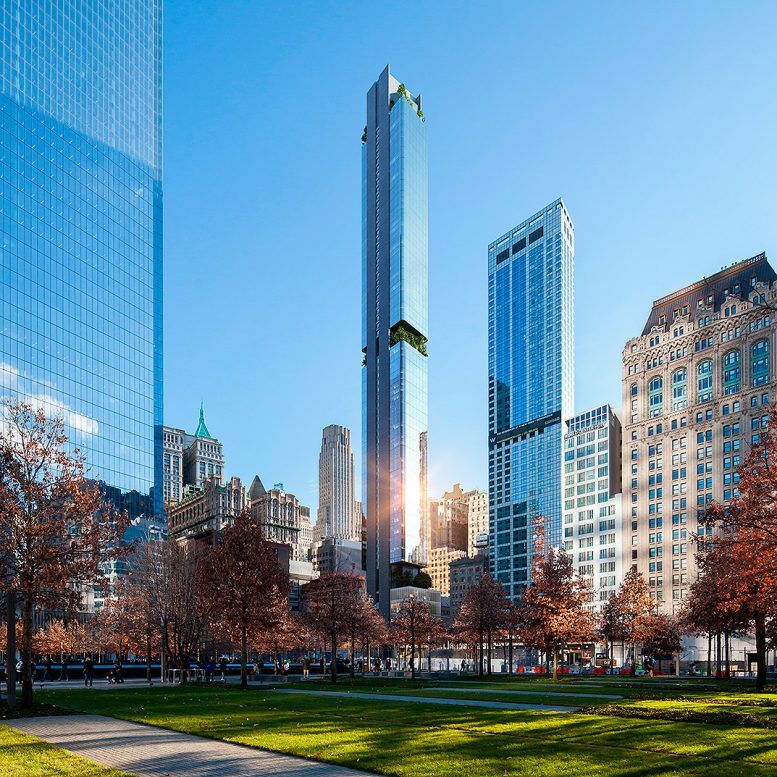 Now, new renderings are out for the building going up at 125 Greenwich Street, thanks to the eagle-eyed contributors on the YIMBY Forums, and they would appear to confirm a final height exceeding 1,000 feet, given the tower will stand taller than the nearby 977-foot-tall 4 World Trade Center at 150 Greenwich Street. The building is being developed by New Valley, Bizzi & Partners Development, and SHVO. The view seen at the top of the page shows off a multi-story section in the middle of the building full of greenery. There is also outdoor space atop the building’s base and on the roof. 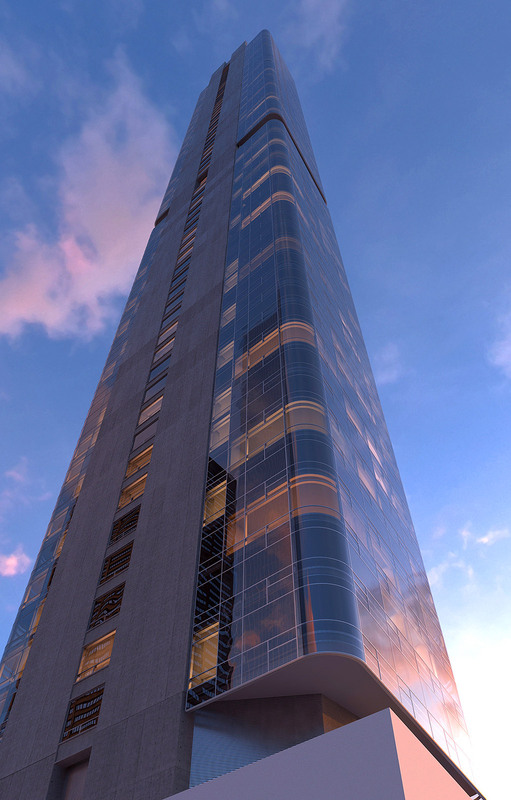 Renderings also indicate the skyscraper’s roof will be illuminated, though whether that translates into reality remains to be seen. Then there is this view, which shows off the texture of the building not apparent from more distant perspectives. The exterior won’t be entirely glassy, with two bands of what appears to be concrete lining the northern side of the tower. According to the most recently filed new building applications, the structure will rise 841 feet, although the new images would indicate a roof height of just over 1,000 feet. The marketing floor count will total 88, though updated DOB applications with the final building height and actual floor count are not yet available. Per Bizzi & Partners, the tower’s 275 units will range from 400-foot studios to 2,500-square-foot three-bedrooms. 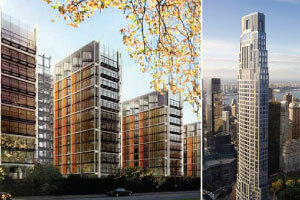 They will have 10-foot ceilings and interiors designed by London-based March & White. The developer also says there will be 16,000 square feet of retail space, though that is not currently reflected by DOB information. The location is between Thames Street and Albany Street. Completion is expected in 2018. The Federal Reserve already backtracked on its plans to continue raising interest rates this year. Britain’s vote to leave the EU creates further global uncertainty and raises the specter of a recession, making it more likely that the Fed will delay raising rates even longer. 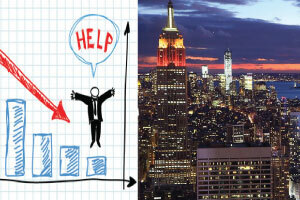 That, taken strictly by itself, is good news for New York’s real estate industry. It means cheap financing. But the damage is done. 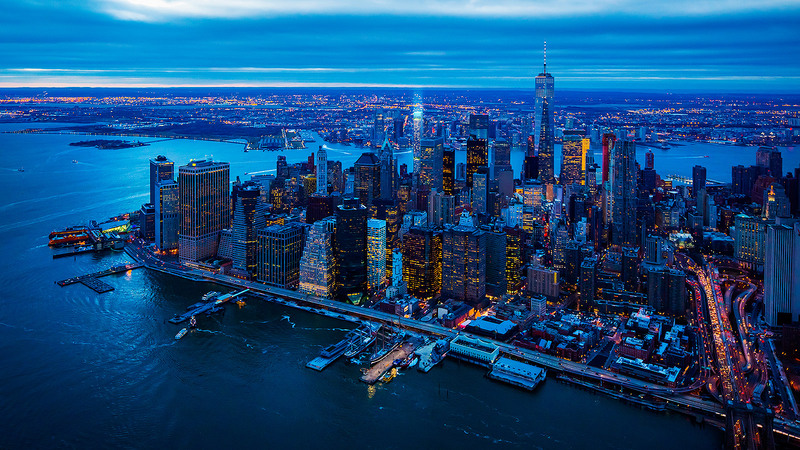 By appearing more stable in comparison, New York City is set to benefit and may well attract more wealthy buyers seeking a stable and safe market to invest in. Expect more money to flow in. 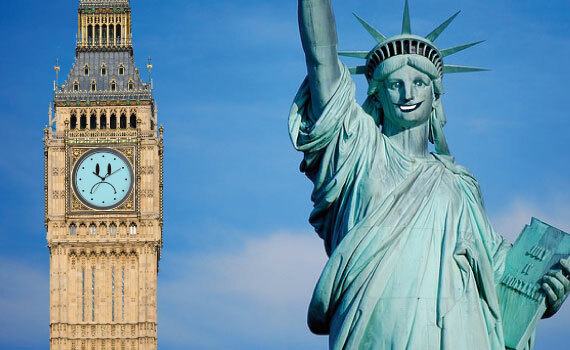 London and New York are the world’s two largest office markets. London has been the world’s financial capital for two centuries, but in recent years, its place within the European Union played a big role in keeping things that way. Back in April, the head of Land Securities, Britain’s largest commercial real estate company, warned that Brexit would lead to a “demand shock” for London’s office market as economic turmoil hits and financial firms move jobs to continental Europe. 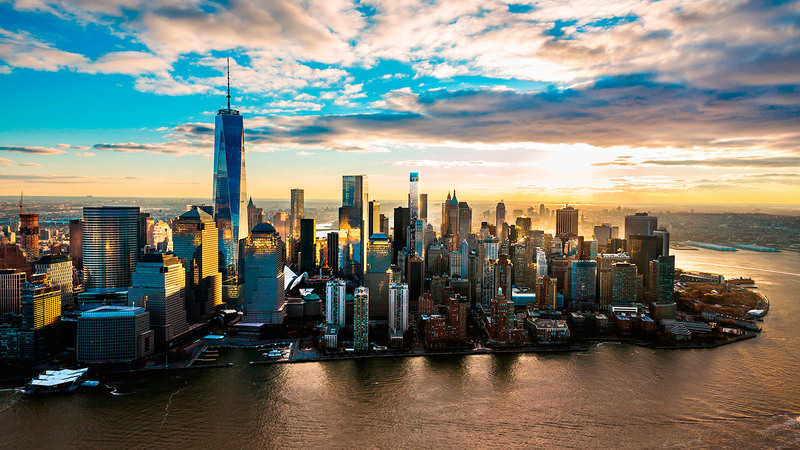 The popularity of London and New York commercial real estate is fanned by the fact that they are “perceived by mainstream investors to be the most likely to deliver strong rental growth in the coming few years,” a Real Capital Analytics report noted last summer. 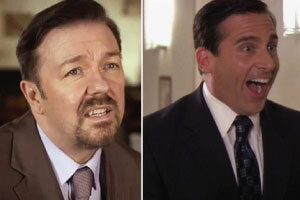 As one falters, the other stands to benefit by becoming more appealing to major office investors. “Too many things are “TBD” in London right now, so NYC office, multifamily and high street retail will likely benefit from even more capital flows,” wrote Daniel Parker of Hodges Ward Elliott. All of the above only really matters if the world economy stays in decent shape. But if Brexit leads to an economic crisis in Europe that spills over into a global recession, no one in New York’s real estate industry will fondly recall the day Britain voted to leave the EU. Three years after shelling out $27 million for a Soho retail building, Joseph Sitt’s Thor Equities is selling 155 Mercer Street for $90 million. Bethesda, Md.-based ASB Real Estate Investments is in contact on the 14,600-square-foot property, which is fully leased to luxury fashion house Dolce & Gabbana, Commercial Observer reported. Thor put the four-story building located between Prince and West Houston streets on the market earlier this year, as The Real Deal reported. Last year, Dolce & Gabbana signed a triple-net lease to occupy the entire property, which Thor is in the middle of revamping for the retailer’s use. Renovations included a restoration of the 1854 façade and a new storefront. Thor acquired the property, a former firehouse, for $27.3 million in 2013 from the nonprofit Joyce Theater Foundation. The building is located in the Soho’s Cast Iron District, and has ceiling heights ranging from 15 to 21 feet as well as 45 feet of frontage. The average ground-floor retail asking rents in the area are $600 to $800 per square foot. Meridian Capital Group’s Helen Hwang was marketing the property. “The opportunity to control a standalone retail property of this size anywhere in Manhattan is a rarity,” she told TRD earlier this year. Canadian investment firm Ivanhoe Cambridge and their U.S. investment partner Callahan Capital paid $913 million for the remaining 49 percent stake in the office tower at 1211 Sixth Avenue, according to public records filed with the city Thursday. Ivanhoe, the real estate investment arm of Canadian pension fund manager Caisse de Depot et placement du Quebec, bought a 51 percent stake in the tower in June 2013. At the time, the deal valued the building at $1.75 billion. Boston-based Beacon Capital Partners had the remaining 49 percent stake. The 2 million-square-foot tower is home to NewsCorp and 21st Century Fox. 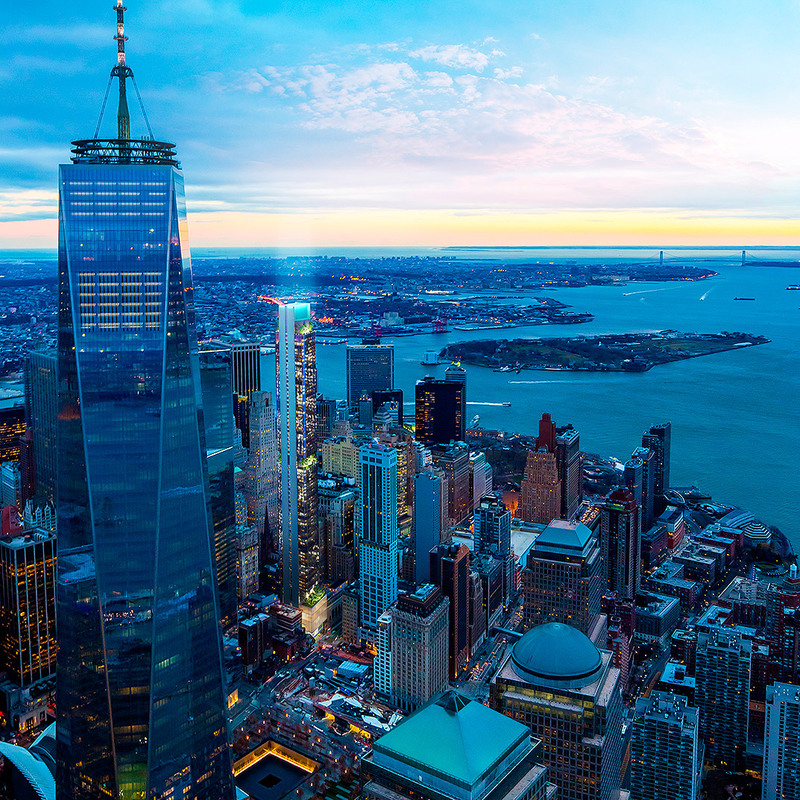 The Rupert Murdoch-controlled media companies considered leaving the tower and last year signed a letter of intent to move to Silverstein Properties’ 2 World Trade Center, but changed track and instead renewed their leases at 1211 and 1185 Sixth Avenue. The Waldorf Astoria may contain condo units for sale. China-based Anbang Insurance Group purchased the hotel, located at 301 Park Ave., for $1.95 billion in late 2014. After the transaction closed months later, the firm’s chairman, Wu Xiaohui,alluded to conversion plans for the structure’s two towers without delving into specifics. According to sources, Anbang’s vision is now coming into focus. Out of the hotel’s nearly 1,400 hotel rooms, the company may be gearing up to covert about 1,000 of them into luxury condos. A conversion of that scale would be consistent with a filing Anbang submitted to the city in early 2015, when it subdivided the building into different sections for condos, a hotel and retail. Anbang set aside 1.2 million square feet—approximately 75% of the building—for residential use, according to the document filed with the city’s Department of Finance, though it did not specify how much space would be used for amenities or for hotel ballrooms. A spokesman for Anbang said the filing was made over a year ago as part of the purchase process, and didn’t actually reflect what would be done with the site. “We continue to explore all options, and no definitive plans have been finalized at this time,” the spokesman said in a statement. In order to convert hotel units into condos, Anbang would have to file plans with the state attorney general’s office. Could a site owned by Gary Barnett’s Extell Development Co. be the home of New York’s first Hard Rock Hotel? Barnett has assembled several parcels on the west side of Eighth Avenue between West 45th and 46th streets, including a garage he purchased last summer for nearly $46 million, to create a development site that can accommodate a soaring tower. Hard Rock plans to announce Monday the location of what the firm says will be its first hotel in the Northeast U.S., in a partnership with Barnett. Hard Rock, owned by the American Indian Seminole Tribe in Florida, operates a successful restaurant in Times Square. Neither Barnett nor a spokesperson for Hard Rock would comment on the location, which the company plans to unveil Monday. Barnett owns other properties in the area, including a development site at 1710 Broadway at the north end of Times Square that can accommodate a super-tall skyscraper and is also a potential location for the Hard Rock. Sources said Hard Rock had been looking to secure a location in Times Square for several years and had previously considered a development site on the north side of West 42nd Street, between Eighth and Ninth avenues, that is currently a parking lot. Barnett has been one of the city’s most prolific builders. In the early 2000s, he built a tower for the W Hotel in Times Square on West 47th Street. He is currently erecting the city’s tallest tower by roof height on Billionaire’s Row on West 57th Street, a 1,550-foot spire that will have a seven-story Nordstrom department store at its base. Hard Rock is trying to secure approval to build a proposed $1 billion casino in the Meadowlands—a plan that has been met with opposition from some New Jersey officials who say it would create competition to the flagging casinos in Atlantic City.